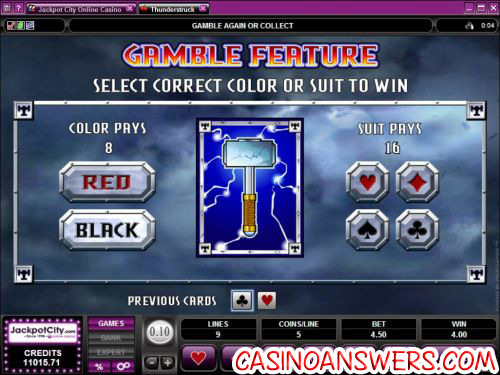 Thunderstruck Video Slot Guide & Review - Casino Answers! Thunderstruck is a 5-reel, 9-line video slot by Microgaming. It has a gamble feature, free spins with multipliers, scatter wins and wild symbols. You can play the Thunderstruck video slot at Jackpot City Casino and All Slots Casino. No, this is not a video slot based on an AC/DC song. Instead the Thunderstruck slot machine has a Norse God theme, much like the Thor Marvel Comics Slot, except this is not based on the comic book. Thunderstruck’s symbols are Thor (wild), Rams (scatter), hammer, castle, horn, bolt of lightning and Thor’s hand holding the hammer’s handle. There are also 9, 10, J, Q, K and A symbols. The slot machine was released back in 2003, so it does look a little dated, but Microgaming is coming out with a sequel, Thunderstruck II, which should look a little more state-of-the-art. The Thunderstruck slot offers an extensive assortment of betting options. You can choose $0.01, $0.02, $0.05, $0.10, $0.20, $0.25, $0.50, $1 and $2 as your coin value. Then, you must pick how many coins you wish to play per line (up to 5). Hit “Bet Max” to play 5 coins on all 9 lines at whatever coin value you choose. The minimum bet on Thunderstruck is $0.09 (if you play all 9 lines) and the maximum bet is $90. 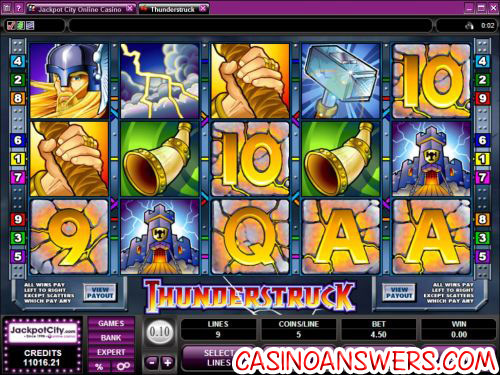 Thunderstruck has an exceptional 10,000 coin top jackpot when 5 Thor symbols appear on an active payline. Thor also acts as a wild symbol for all but the Scattered Ram symbols. Thor will double any winning combination he completes. If three or more Scattered Ram symbols appear on the reels in a spin on Thunderstruck, you will win 15 free spins with a 3X multiplier. All of your wins will be tripled. You can trigger the free spins feature again during your free spins. Scatter wins are multiplied by the total number of credits staked and will be added to your regular payline wins. As with all Microgaming slots, Thunderstruck includes an autoplay feature. This is perfect for players who want to play a lot of spins without doing a lot of button clicking. You can choose your number of spins, number of seconds between spins and stop settings (if you win enough, lose too much, trigger the free spins feature, etc). Gotten over your head? You may cancel the autoplay feature at any time. There are also 5x and 10x quickplay buttons you can use with no stop settings. While perhaps not the newest and hottest video slot in the Microgaming library, Thunderstruck is still a good video slot. If you are looking for a place to play Thunderstruck, we would recommend that you try Jackpot City Casino for a $500 signup bonus. Is the Thunderstruck video slot US-friendly? Microgaming casinos do not allow USA players to sign up and deposit. For some US-friendly video slots, we recommend you play at VIP Slots Casino. Does Thunderstruck have a progressive jackpot? Thunderstruck does not have a progressive jackpot. What Thunderstruck does have is a 10,000X top fixed jackpot, which is quite an impressive win by itself. If you’re looking for a Microgaming progressive jackpot, try playing Mega Moolah. Can I play Thunderstruck on my mobile device? Yes, Thunderstruck is one of the many Microgaming games you can play on your cell phone, thanks to Jackpot City Mobile Casino! Jackpot City Mobile Casino offers a 150% bonus up to $150 for all you heavy cell phone and mobile users who just can’t get enough online casino gaming. What slot machines can I play on my cellphone? What casino games can I play on my iphone?